Your work is so amazing, many times I have tried it myself and failed, it makes me appreciate art more to see your fantastic art. Just absolutly beautiful! And the Animations are just as fantastic! I wish you could do just one more request for me, nobody seems up to it. LTB SB Luparies family (or individual members) PM me! ^ Looking for M/F adults and M/F hatchlings frozen below 2%. 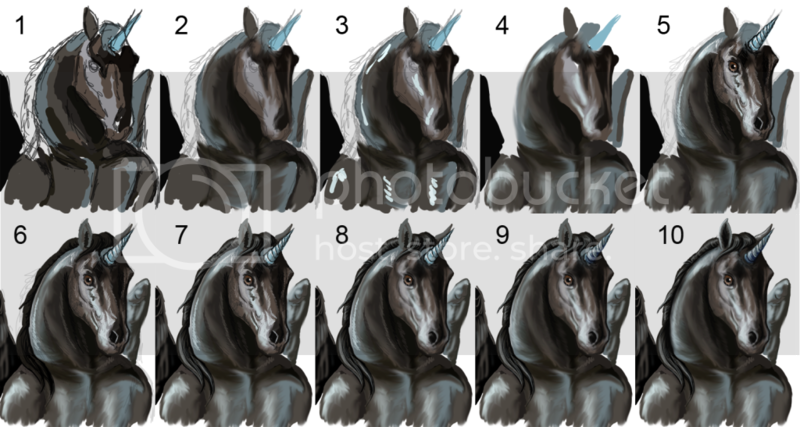 I have saved a few wips of how I did the winged unicorn pic for a step-by-step explanation of how I paint something like that, if you want I can send you the link once I am done writing the explanations (and if it is still uploadable due to size in the end xD). YouÃ‚Â´ve made me curious...what would you request should I open again? everyone I have asked has said that doing the detail and the other cat ASWELL would drive them mad. Oh well, What is a wip? Oh, yes a wip would be wonderful! I like seeing how things get made. Well, she's got special markings that seem to be quite hard (dont know why) and her face in this picture is like a smile but her teeth show in a smile, so like shes laughing, sort-of.The face is what they say is hard. If you want you could give me a description...I cannot promise or guarantee that IÃ‚Â´ll have time to work on something but a sketch that someone else could colour might be doable one of these days. Start adding details to the shading with a small brush, mainly roughly filling in the light and dark areas that will differentiate the structure of the face, using the lines of the sketch as orientation on where to place the main characteristics like the eye, nostril and horn. Those things should be placed on a seperate layer so that one does not accidentally paint over them later on. Adding detail to the mane by using the lightest and darkest colours, defining the direction the different strands have with the length and direction of the lines. Think I managed to fix it? and wow.. love that uni!! and thanks for the step by step guide... do you mind if i save it and try something later on? not with the same img of course, but with the idea of the layers and how you managed to blur each bit making the final img.